The Toe Squat Pose is deceptively simple in appearance, yet it is a very intense pose for almost everyone. Nothing will open your ankles, feet and toes quite like this one. If you are a hiker, runner or walker (just about everyone!) this pose is for you! This pose is especially helpful if you have plantar fasciitis as it will stretch the plantar arch at the bottom of your feet. If you don't have plantar fasciitis, this pose will prevent this extremely painful condition. The practice of Yin Yoga is never easy, no matter which pose it is you try. That's because it was intended to take you to your edges, so that your joints, ligaments, tendons and fascia will benefit. Deeply opening your joints is so important to maintain your health, stay young and injury free and enjoy full range of motion to participate in all of life's activities. Nothing is more healing of your body, mind and soul than Yin Yoga! In this pose, it is the use of the weight of your upper body, providing downward pressure that stretches the ankles, feet and toes. Because this pose is so edgy, if you feel intense discomfort, don't stay in it for long. A full 3-5 minutes, which is the usual long-held time for Yin Yoga poses, is very difficult for this one. Come to a kneeling position on the floor. Tuck your toes under your feet, so that the top part of the balls of your feet are on the ground. Avoid doing this pose on the tips of your toes. Then, sit back onto your heels, as shown below. That's it! That's the pose. Notice how you feel when you first sit back on your heels, and try to hold the edginess for a full minute. Breathe deeply and make an attempt to find stillness as you hold the pose. This is a great pose to learn how to stay within your stillness despite the intensity of the pose, as you hold the edginess! Calm your mind and remember to breathe deeply as you do this pose and you will be able to stay with it for a longer period of time. You may also place your hands over your heart in the prayer position as show below, or you may do Eagle arms or Cow-Face arms to open your shoulders at the same time. When the pose becomes too intense, simply rise back up unto your knees. After a few breaths, sit back down onto your ankles and try again. This pose is also a mild knee opener, so if you have tender knees, place several layers of a blanket or your yoga mat under your knees. If your ankles, feet or toes are really tight, you may wish to place a small towel roll or cushion under your hips to sit back onto. If you choose to also work on your arms and shoulders, spend 2-3 minutes sitting back in the pose, rise up again on your knees, change your arms to the opposite side, then go back to the squat for another 2-3 minutes with your arms in the second position. You can also alternate the Toe Squat with Ankle Stretch pose, to distribute the intensity of the squatting position. Click on the link above to see a nice sequence that alternates between these two poses for total health for your ankles, feet and toes! 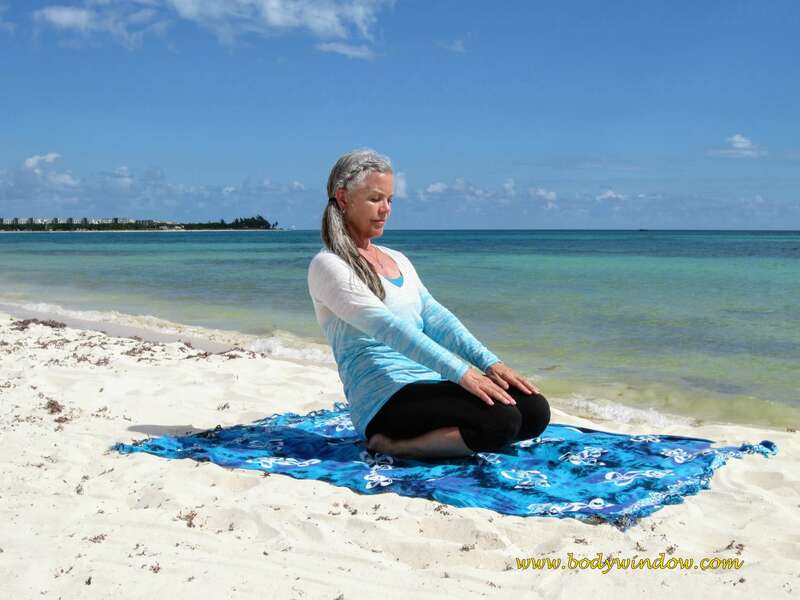 These two poses will stimulate your grounding energy! This is a wonderful sequence if you have any type of foot pain, like plantar fasciitis. Additional benefits of this intense pose, is that all the major meridians of the body that start in the feet are stimulated when you compress the ankles, feet and toes. May you find health for your feet, ankles and toes when you do the Toe Squat Pose, and prevent painful conditions like plantar fasciitis. May you learn the life practice of finding stillness within your physical and emotional edges, for healing and health of your body-mind-soul!